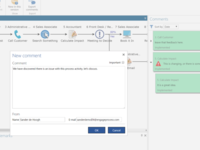 Engage Process Suite Reviews Recently Reviewed! Overall: I came across ENGAGE whilst working as a business analyst consultant and doing workshops in the traditional Post It, paper, Visio and Excel way. I found this software and tried the free trial. The guys at ENGAGE did a quick webinar and I was up and running in an hour and have not looked back since. The first process I mapped was my existing process improvement process using the software to show how much quicker and better it would be to use the software for my role. Quickly I was able to show that as well as providing better outcomes I was also able to deliver the same/better for around 25% less effort and around 40% quicker lead time. I showed this to my boss and immediately he agreed to purchase the software. The software enables me to map live in process workshops with the stakeholders saving massive amounts of time in write ups. The added bonus of mapping live in the workshops is the stakeholders are familiar with the process maps and feel a sense of immediate ownership as they were part of creating them. The user friendly icons make it very easy for non technical staff to understand the maps. 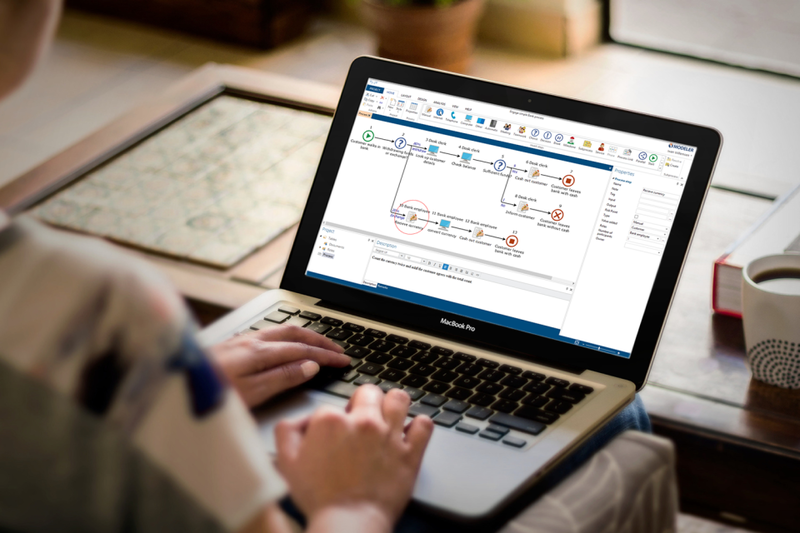 In the software you never have to draw a line or move maps around it offers simple drag and drop, copy and paste functionality that makes it easy to add forgotten process steps. The software will move the map around as you add, move or insert steps. Viewing the process from different perspectives (swim lanes) is easy, you map once and with one click you can switch the view into a roles based swim lane. You can add additional attributes to your maps such as IT systems or locations which not only gives you more swim lane views but generates additional reports. The lean functionality within the software allows you to classify the value against process steps and add really rich data against each process step such as descriptions, inputs and outputs. You also add costs against each role, processing times and break times meaning instead of a process map you create a fully costed process model. The powerful analysis tools enable you to identify and improve your processes. Your 'To Be' models can be compared to your 'As Is' with a click showing benefits (across a multitude of statistical measures) and creating a business case. 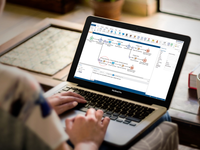 The tool offers a multitude of export options into things like Visio, Word and Excel. Add to this an interactive Brainstorm function with apps for smartphones and browser accessibility which again saves time for analysts. Recommendations to other buyers: Yes don't waste time thinking or talking about whether you should buy it. Sign up for a free trial and map some of your processes and see the benefits it offers over the way you currently do things you will not look back. Pros: Simplicity, it's easy to use and to share with others. Using it in a workshop setting is brilliant, it allows the focus to be on what happens rather than keeping track of post-its and added notes. Cons: I would love to be able to produce reports from a template to suit my customers, I can do it manually but it would be good to be able to set or select a template. It is on the wish list for Engage to implement in a future release. Overall: I have used this software with a large number of customers. I have been able to demonstrate how they can improve and transform their processes. Not only this, it enables staff engagement in the mapping of the current process and in the development of a proposed process. Pros: We all love the brainstorm part of modeler here at RBH and it is used a lot from team meetings to full scale Annual members meetings. This years response rate for questions was 100% improved when our customers could use the tablets to post their questions. Overall: We started 3 years ago to describe our processes in Engage Process Modeler. It is a great experience to discover together with a team how easy and helpfull this tool is. Now we have our whole quality management system including work instructions in Engage available for all our employees. Recommendations to other buyers: Just start with small processes, learning by using it! Pros: Easy to use, quick to develop process maps/work flows. Creation of client specific icons make user understanding quicker and easier. Cons: Could do with more outputs. Overall: We use the Engage Modeler Tool for mapping processes on Projects when the recording of the process cannot be completed. The initial issue is usually the configuration is incomplete or simply does not work, bringing the Project Team members together and using the Modeller accelerates the process. We create what-if type scenarios to get agreement from the Team so that configuration work can be completed and the step by step eLearning completed. We then embed the Engage workflow maps into the content to support the users understanding of the end to end process. Overall: We are very happy with Engage. We use it to create quick insight into our own processes and our customers. We organize workshops with projectteam. It is valuable to detect bottlenecks immediately and weaknesses and get started to make them better. The icons sets and the swimming lanes are ease of use and are highly appreciated. Any company that is in motion or has not changed for a long time needs a tool like Engage to help them. It doesn't matter if you work in a big or small organization. We also recommend the people from Engage, they are very helpfull and make a great product. Recommendations to other buyers: It takes time and energy to use the product properly. Pros: Visualization and customization of processes. It's very easy to deploy the tool in the business. The tool supports multiple business goals like standardization of processes, operational manuals, process improvement, BPM and even in the sales process. Cons: A bit light on the papertrail side. There is some basic info in who's done what at process level, but no reports supporting that. Pros: I like the fact that Engage is much more than just a visualisation of a process. Due to a strong data dictionary in combination with well thougth 'rules', This forces the users to develop a real process definition in stead of a nice drawing. Cons: I've quite a lot of experience in defining processes. Therefor I'm able to use the Engae without a lot of support. However, less experienced users find it rather difficult. 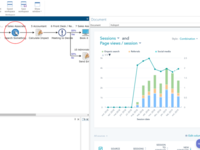 Overall: I've applied the Engage Process Modeller at several clients, and I am surprised to see how this modeller really helps to let people understand and optimize their processes in inter active approach. Recommendations to other buyers: I would like automatic updates in existing the modeller, without the need to refresh first after changing the tables. Pros: Because its simplicity of describing a process it is easy to use. Also the possibilists to optimize and request feedback on existing processes is a nice feature to keep everything up-to-date. After following a workshop (definitely recommended, very educational, interactive and even fun) al users where very motivated to start working with Engage. Cons: There are a lot of ways to find and asked for help but I would like to see a more useful (detailed) instruction manual to find an answer by myself. Pros: This software allows you to easy create diagrams, implement with the financial areas, operations areas and so on. The interface It is very easy to use and you can have support from backoffice anytime. Cons: Maintenance of a group of processes or activities is complicated. Spacially when your working with End to End processes. Overall: Engage is a really easy to use tool to quickly model and capture all processes in the business. 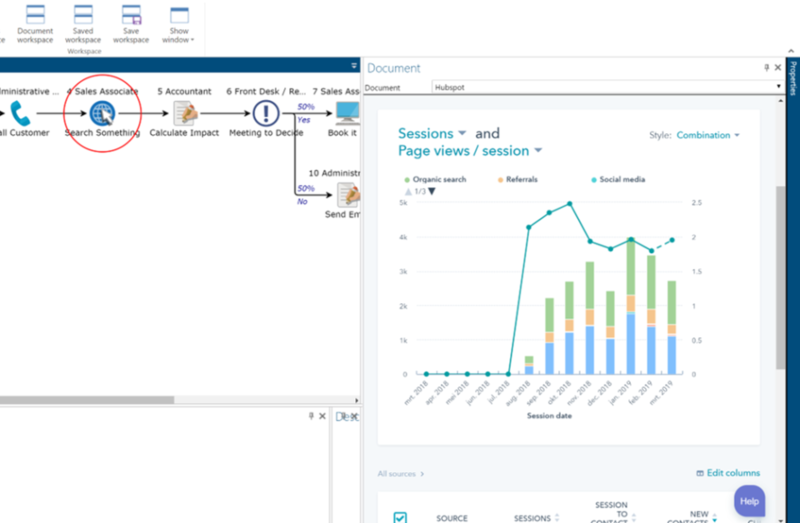 Once the processes are captured and published we especially use Engage to train employees to read, understand and learn these business processes and embed them (online) as reference documentation! Recommendations to other buyers: Excellent experience using it as a tool to train process-understanding! Cons: More reports would make it even better! Overall: My business has been working with the Engage applications for a number of years now, supporting our support services to UK Financial Services firms. We have had great success with the tools and our clients are often so impressed they choose to sign up themselves. It is hard to imagine a software investment at this level, that could deliver so many business benefits. Businesses can learn how to streamline their operations and enhance their customer experience. A great product from great people. Comments: I am a Lean and Change Management Master Practitioner and have used Engage Modeler for many years in many organisations including Councils, Universities, the Home Office, the Ministry of Defence and certain well known brand name companies. In this work I have captured hundreds and hundreds of processes using Engage Modeler, usually within service improvement, transformation and change programmes. 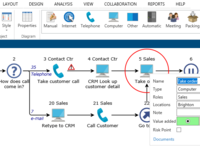 Engage Modeler has been and still is unique as there is no other process tool on the market where you can capture straight into the tool when using it in group workshops with front-line staff to capture AS IS processes and build TO BE processes. It has many features which I will not list out here but the rapid capture is fantastic and then to be able to evaluate the process using Activity Based Costing (ABC) within the tool provides an immediate outline business case for change. I have given 5 stars in every category of the review and this is really true, a wonderful product and great team at Engage. Well done guys! Cons: Maintenance of a group of processes is sometimes complicated. Overall: The software is easy to use. More important is that is improves the dialogue with teams and really supports co-creation. Evenso the software has strong analytical possibilities both logical as mathematical. Overall: Easy to use process modeling software that does what's promissed. The Customer Support. or Helpdesk is well organized en very friendly. Furthermore the comany provides free demo's to introduce (new) users to (new) functionality. Pros: Visualization of processes, understandable icons, easy to use and easy to change the processes in a workshop (flexible drawing). Overall: We mostly use Engage when modeling processes within organizations to help people to see the way they work, further then their own workspace and discover possible proces-improvements. Great tool to do that, great visualization of 'order to invoice' processes for example. After that the organization sometimes adopts the tool. We know the proces visualization (step by step) is just a small part of the functionality, which is much broader en still being developed, for us as business consultants, this is however still the most important and valuable part. Overall: The tool is self explainatory and customer friendly. When problems occur the support desk is always there to help. And they only stop their support when the customer is satisfied. Great! Software is very easy and useful! Comments: This software is very useful and easy to use. Because the software `draws the process diagram itself, you only have to focus on the actual activities and the information you want to be available. 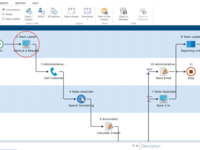 With one button you can switch from value stream to swimlanes and back, which gives you the opportunity to present the process a way that is best understood by the user. Drag and drop allow you to easily change the sequence if necessary. Per activity a lot of information can be stored uniformly in pre-set fields or field you can specify yourself (per organisation) e.g. RASCI, hyperlinking of documents, input, output, ICT systems, notes, 3 free text fields etc. For management purposes many reports are available. I still enjoy using it, even after two years experience. Comments: I learned about the program in school and I used it a lot there. At the job I am working at the moment we had an issue with visualizing processes so that we could review them. So I showed my manager Engage because my experience was good with it. After a demonstration my colleagues were interested as well. Now that we bought the program we use it a lot to visualize certain production processes and also optimize them. Because the program is so easy to use every body can work with it. So our overall experience is positive. Pros: It's easy to use, very intuitive, if you're used to microsoft products. Cons: it's oldfashioned and too much related to an hierarchial organization (by sharing and publicating processes or giving permission to look of work with the processes). The look&feel of the product has recently been renewed completely. The pictures displayed reflect the latest version. We are curious to learn about wishes for new features and functions. 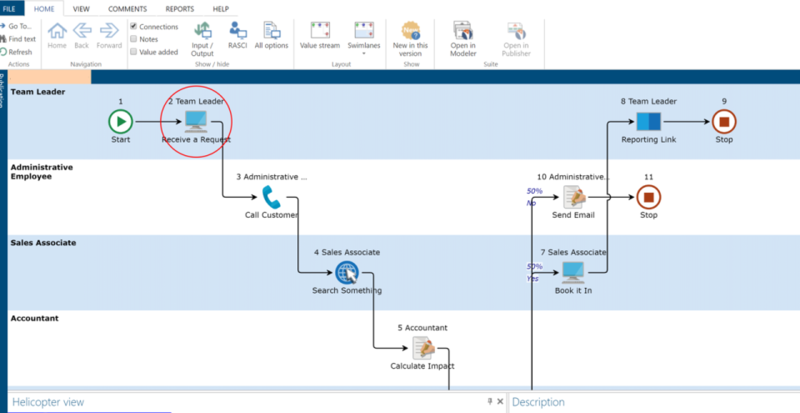 Miles better than process mapping in visio! Pros: Very easy to explain to end users and they respond well to the icons as they are simple and informative. Cons: Due to the number of clicks to input the detail into each step it can be quite time consuming to do. The print options could be better - the actual process map does not print well - often cut off over pages. 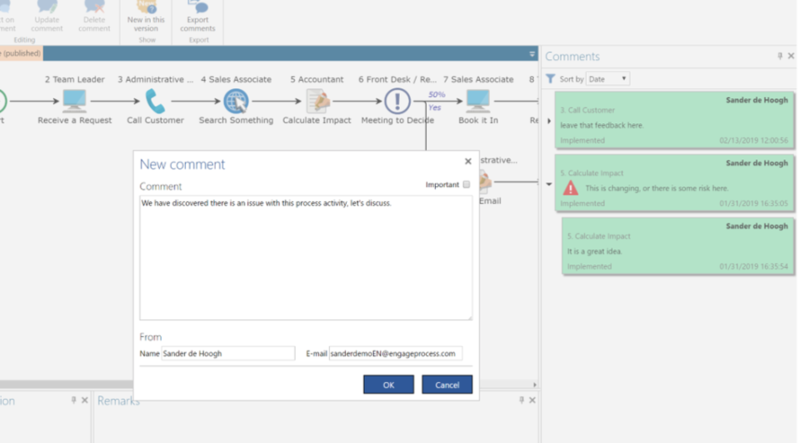 Comments: Engage Process modeller is a powerful and easy to use process modelling tool. Due to an intuitive user interface it is easy to start modelling a process. And with the powerful calculation functionality you can get great insights on the performance of a process. Comments: Easy to use and friendly icons. Very easy to switch from value stream to swimlanes and back. Different analyses and reports are available.